As the eighth largest city in the U.S., San Diego’s population of 1.4 million people has increased by 50 percent over the past three decades. With an average rainfall of less than 12 inches per year — and almost none of that falling between April and October — water is an extremely precious commodity. 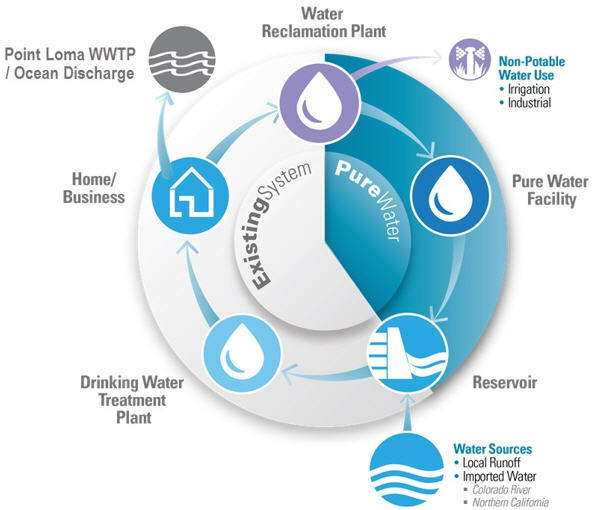 The Pure Water reuse program is just one facet of a larger sustainability effort that incorporates water conservation, recycled water, renewable energy, and more. Conservation. At the most basic level, San Diego mandates a variety of permanent water restrictions to manage allowable uses and limit waste. The city even supports a Waste No Water App to aid in water conservation. Residents use their smartphones to take and transmit photos of wasteful water use — such as a water main leak — and the app automatically generates a specific GPS location for city crews to follow up. Desalination. The San Diego County Water Authority operates a 50-MGD desalination plant to satisfy about 7 percent of the region’s water demand. The Pure Water San Diego alternative will consume only about 66 percent of the energy, generate just 70 percent of the greenhouse gases, and cost about 75 percent of what the current desalination process requires per MGD. Recycled Water. The city has built two water reclamation plants in the North Bay and South Bay areas to provide water treated at a level approved for irrigation, manufacturing, and other non-potable water uses, according to California State Water Resources Control Board regulations. As an incentive for users to switch to that recycled water for non-potable uses, it is priced at less than one-third the current cost of potable water. The goal by 2035 is to elevate recycled water’s share of total citywide water usage from the current 8 percent up to 33 percent. Pure Water San Diego. This program is designed to go one step further by using proven technology to turn recycled water into safe, high-quality drinking water. 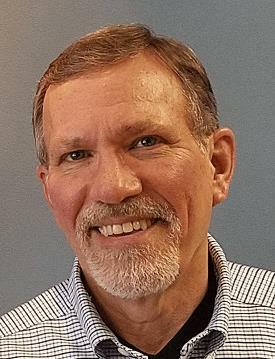 The goal is to reduce the city’s dependence on the increasingly costly water “imported” from the Colorado River and the Northern California Bay Delta. Phase 1 of the program, scheduled to break ground in Spring of 2019, is targeted to produce 30 MGD of purified water to be mixed with imported water stored in the city’s Miramar Reservoir and serve the northern areas of the city. The blended water from that reservoir will be treated at a drinking water plant before being introduced into the potable water distribution system (Figure 1). Figure 1. Pure Water technology will extend current non-potable water recycling efforts by treating up to 30 MGD of water reclamation plant output to levels safe enough to replenish city reservoirs. The program’s long-term goal is to produce 83 MGD of purified water to serve all areas of the city (Figure 2). That is forecast to be one-third of the city’s consumption by 2035. It is estimated that the current average San Diego resident uses approximately 65 gallons of water per day, which is only about 75 percent of the national average daily use of 88 gallons per person. Figure 2. 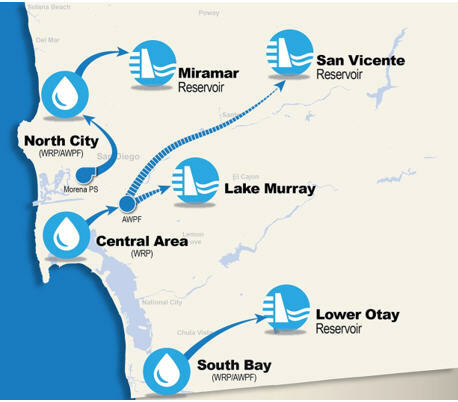 The ultimate goal of the Pure Water program for 2035 is to recycle up to 83 MGD of San Diego’s potable water by treating it and storing it in reservoirs spaced throughout the region. In preparation for rolling out the program, the city created a demonstration facility to prove that the total process could deliver water pure enough to meet all federal and state drinking water standards. It uses ozonation, biological activated carbon filtration, membrane filtration, reverse osmosis, and UV disinfection with advanced oxidation (Figure 3). Figure 3. Multiple advanced technologies are used to purify effluent from current water-reclamation treatment levels to a level safe enough to merge with stored drinking water source water at area reservoirs. San Diego has taken significant steps to document the reliability of Pure Water technology. In a one-year period alone, more than 9,000 tests were conducted on 342 chemical and microbial components and water quality parameters. Since mid-2011, the city’s Pure Water demonstration facility has been supplying 1 MGD of purified water. In all, more than 50,000 water quality tests have been conducted to document the performance of the technology. The estimated cost for current purification at the Pure Water demonstration facility is $1,700 to $1,900 per acre foot — i.e., 325,851 gallons. While that is higher than the current cost of imported water ($1,200 to $1,400 per acre foot), it is still less than one cent per gallon. Over time, that cost will become even more attractive considering projections that San Diego’s imported water rates are expected to double over the next decade. That is a continuation of the progression that has seen imported water costs triple over the past 15 years. San Diego recently received a $614-million U.S. EPA loan, which the city will put toward the $1.4-billion Phase 1 budget for the program starting with the 2019 construction.